It was a bleak and grimy day. Clouds hung low in the sky with the menace of rain – the kind of day when mood mirrors weather. But contrary to Nature’s cheerless condition, my heart was light, my step was springy. This was The Day. This day was my carrot dangling before my salivating brain during three long months of focused labor. If I finish this project by this date, I will allow myself a weekend off, doing whatever I want to do. Part of what I wanted to do was to spend a nice stretch of hours on a Sunday afternoon in the leisurely pursuit of stitching. In the company of a good audio book, I would hole myself up and revel in the delights of embroidery, with no interruptions and only the birds outside my window for company. I could picture it perfectly, and I was all set to enjoy it. With my work table clear, Late Harvest set up before me, audiobook selected, lights situated, tools accounted for, I settled down to a guilt-free afternoon of quiet stitching. You do know what happened, don’t you? I seem to recall calling it a few choice names. The electricity went out, of course! And my workroom was engulfed in a cloak of half-light gloom. My Happy Mood Balloon deflated. You’ve got to be joking, said I.
I played the waiting game. Nothing happened. I got on my mobile and started making the rounds. What’s going on? I asked everyone I knew. And then the answer came: Scheduled power outage for upgrades. Four hours. Don’t you read the newspaper? Oh, rats! I cried. (Or something akin to that.) Now what? 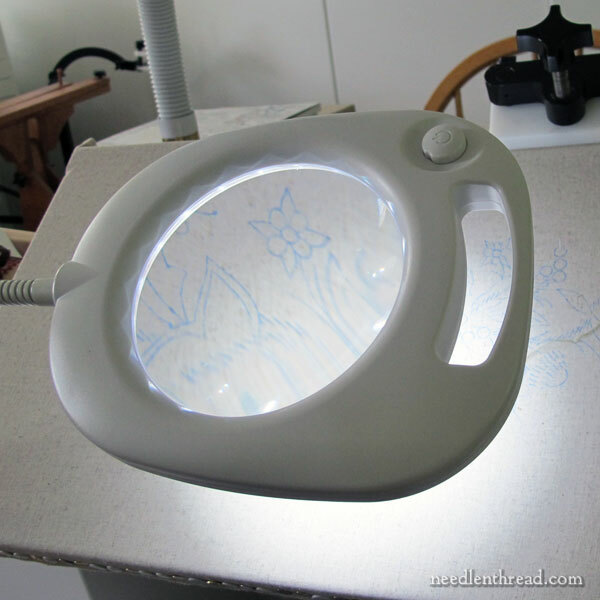 The magnifier that I use when I need magnification is the Craftlite Dublin magnifier and light combination unit, that I reviewed here years ago. I’ve had it for almost five years, and it is a trusty thing. It’s held up well and it works great. It has a special feature on it – it has a battery pack so that it doesn’t have to be plugged into a wall (a nice feature if you take it to classes, camping, or the like). And when the light dawned in my head about this fact, my Happy Mood Balloon inflated again. My dad always stowed batteries in the house for emergencies (in his sock drawer, of all places), and he somehow instilled that habit in me. I rummaged through my sock drawer, found the Needful Things, set up the battery back, and rejoiced! And then, before me, under the magnifier, in the glow of the light, I started noticing things. For example, I noticed that this filling in the photo above is not quite right. The two parallel lines of green, where the arrow points, should not be parallel. The one on the right should be offset. Then I noticed this thick bulk of thread in my bead line in the photo above. That shouldn’t be there. Where did it come from? A knot? A thread I didn’t pull through all the way? Of course, if I can only see these things under magnification, then I really shouldn’t sweat them, right? But then the thought occurred to me that maybe, while I’m working on this project, I do need magnification. The lattice fillings are quite fine and quite closely worked. The beads are pretty tiny. 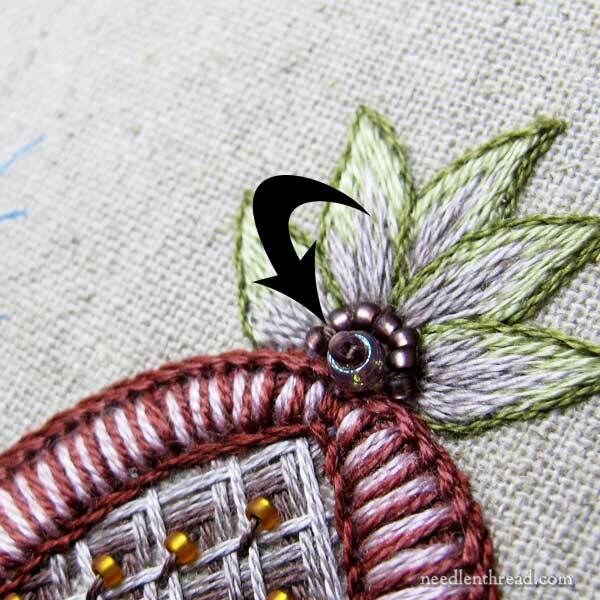 Maybe this piece would benefit from magnification, at least in the areas where beads and woven fillings are concerned. 1. 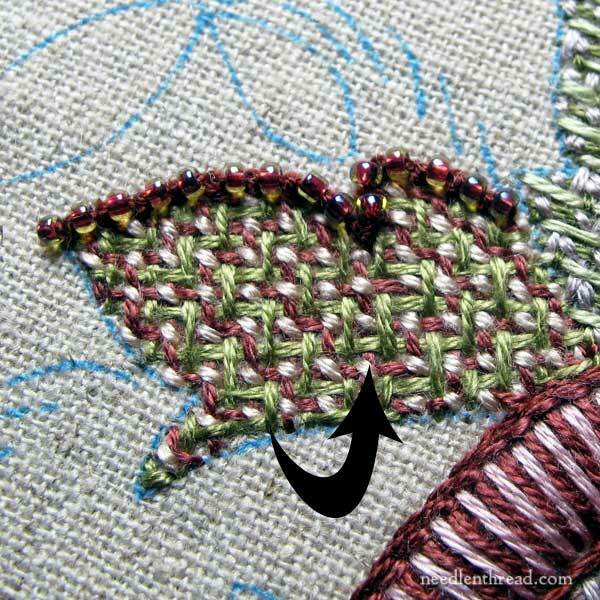 It’s impossible to stitch well in the half-gloom of a rainy day. 2. My magnifier-light has a battery pack – and it works! 3. I might need magnification more often than I realized. At least, it doesn’t hurt to occasionally check. 4. I should probably read the local newspaper now and then. And thus ended my day off – a good day all around, I’d say! Well, magnification has its upsides and down sides – on the upside, it shows you your mistakes so you can fix them, and the downside is, it will show you your mistakes so you can fix them. I keep my hurricane preparedness batteries in the fridge, supposedly they last longer. Thanks be to Heaven, I haven’t had to put them to the test, yet. I am going to buy the magnification light today! During the spring and summer here, we always have storms and power outages. They may not last long but it won’t stop me from my hand work any more. Thank you! Hahaha!! A snapshot of a day in the life of Mary! Well to me it is always important to learn from what is happening, which you did. Thanks for sharing with us Mary. “The Day the Lights Went Out” somehow put the song “The Night Chicago Died” into my head. Weirdest ear worm ever. Or…”The Night the Lights Went Out in Georgia.” That is the one I got stuck. I do a lot of embroidery, both for myself, and on commission. I nearly always wear magnifying glasses, as I believe that if it looks fine with those, it is going to look good without! Oh, I have all kinds of favorites, from classics to mysteries, to travel journals, etc. It’s hard to pin down an absolute favorite. I love Cranford – the audiobook was excellent, and I’ve listened to it twice. Might be due for another listen! North and South is good, too, and Wives and Daughters. I liked the BBC movies as well, but I enjoy listening to the books even more. There’s one Gaskell book (I think it’s called Ruth?) that I listed to that was like having teeth pulled – it went painfully on and on and on and on, and I just wanted slap the “heroine.” But the other ones are really good! Yes, it definitely sounds like Ruth. I did read it – after all I had started it – but it was a chore. I read your review on the Craftlight Dublin. I do my work sitting on the couch with a floor lamp. The problem I have with the magnifying floor lamps is they don’t adjust low enough. We’ve bought several and I can’t use them, so I end up wearing two pairs of glasses. Has anyone found a magnifying floor lamp with adjustable height? OttLite makes a gooseneck floor lamp with two bases so you can also use it as a table lamp. It’s the one my husband uses and I sometimes borrow. I do not remember the brand name of the one I use almost all the time, but I bought it at an art supply shop. Similar to the adjustable OttLite, it comes with both a floor base and a table-top base, as well as a clamp-on base for tabletops. It has three light settings and a smaller, gooseneck magnifier attachment for when you need super close-up views. It also cost me an arm, a leg, an ear, and my firstborn! I also found I couldn’t adjust my lamp for couch-sitting, so I changed my seat. Of all things, a plastic garden chair was the right height and held my back at the correct angle so I could sit and stitch in comfort. Looks a bit odd in the living room, but a living room is for living in, right? Yep. Pulled out the magnifier/light for this project AND the magnifying headset as well. I am one of those people who use magnification for everything – once you get used to it, it is hard to accept anything else without all the gizmos in place. I bought the Dublin many years ago after winter storms and hurricane related power outages made me clip a booklight to my Dazor so I could stitch through the storms. It is a very versatile light and I take it with me for classes now because it is lighter than the Dazor… the only thing that could be better is making a more retentive and smaller clamp. Otherwise it is a great magnifier but at home under normal circumstances I still prefer the magnification of the Dazor. It is good to have options though. I can also highly recommend the service and friendliness of Keepsake Needlearts in New Hampshire if people are wondering where to get it. No affiliations just a very satisfied customer. Hurray for dad’s that instill quirky habits!! Late today been out for coffee with friends. Oh you poor thing I bet you could have cried, but in a sense it was good thing to happen because by using the light and magnifier you saw your mistakes, not that I would have noticed them unless you pointed them out and yes I use the Craftlite Dublin magnifier all the time ever since you reviewed it and I have to say I can’t do without it as my eyes are not as good as they used to be and I can’t stitch without a light and magnifier. Thanks for sharing your dilemma and for introducing agina the craftlite dublin magnifier which is great. It was after reading about your type of magnifier on here some time ago that I bought one ( it was on offer at the time, so even better!) and it’s been absolutely fabulous! As I sit by the window, and only sew in the daytime, I’ve not needed the power pack so far, but so glad you had some batteries to hand, Mary! What would you have done otherwise?! Beautiful work going on, Mary, glad you got that straightened out. Magnification is good for those who have less than perfect sight, like me. As an employee at a local newspaper, I totally agree!! I appreciate that you point out these imperfections, thus making the rest of us realize we all have issues with our stitching. Here is another perspective: I have come to the conclusion that in nature there are small places where flowers do not all look picture perfect either. Sometimes flowers do not all curl the right way and stems are not always exactly curved and bunches of pollen make the centers of flowers look a little too big or fluffy. Wind and rain play havoc on leaves and fruit can get a discolored spot from hail damage, etc. If at times these types of imperfections are found in my stitching, I see it the same as mother nature creating individuality in my creations, not worthy of tearing out, but worthy of noting that I have deviated from the pattern or added one too many stitches. If I have to use a magnifying glass to see it, then I have learned it is okay to live with some of these imperfections. Students and people who are new to stitching and sewing for that matter can spend so much time making something perfect that they do not enjoy the new skills they are learning. I would rather rejoice that I have finished and given my pieces some character, than worry that my work is perfectly stitched. If it can’t be seen from 6-8 feet away which is how most of us see pictures hanging on the walls, then it is okay to leave in your minor mistakes. Hope you have a great stitching day!